Kia certainly knows a thing or two about embracing the box design. After all, the styling of the Soul is certainly a perfect interpretation of the good things boxy shapes can create. With that in mind, Kia has set to reinvent the van with its new KV7 Concept here at the Detroit Auto Show. But we aren't talking minivan - this is pure, boxy conversion van hotness. Inside, there are clever features like swivel chairs for all occupants (including the driver), and the rear quarters are set up in a sort of lounge fashion. There are nifty gadgets like a floating table-top computer and full wireless internet capability. Wrap that in a sleek, boxy package that boasts a 285-turbocharged four-cylinder engine and the end result is a van that means serious business. As much as we'd love to see this concept come to fruition, we'll chalk this one up as just another example of what happens when you let automotive designers run wild. See for yourself in the high-res galleries below. 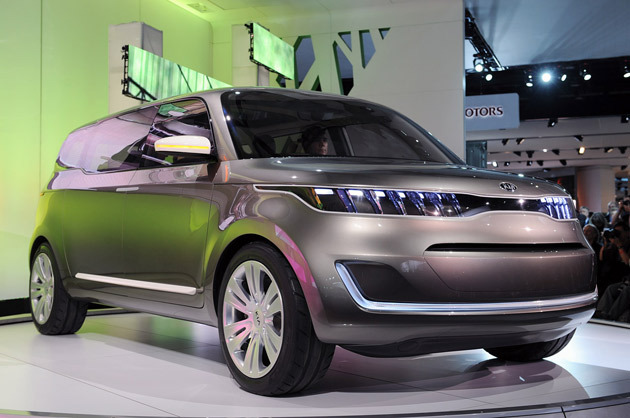 Live photos copyright ©2011 Drew Phillips / AOLDetroit 2011: Kia KV7 Concept is a van with a plan originally appeared on Autoblog on Mon, 10 Jan 2011 18:58:00 EST. Please see our terms for use of feeds.